For this week's "Let's Play Co-Op" stream (every Monday night at 10:00 pm EDT), Nick, Mike, Locke, and Jason hopped into Eden Rising: Supremacy, which hit Early Access last week. This third-person exploration/tower-defense title definitely has potential, and it has a very solid co-op experience at its core. There are a few things that, in my opinion, Eden Rising: Supremacy does right. For starters, it puts the whole "enjoy this game with your buds" idea up front by letting players create their own servers to which they can invite just their friends. While you can play the game solo if you like, it definitely feels like the kind of game that is more fun with one, two, or seven friends and working together. Because that cooperative idea is embedded from the start, there are a number of systems and mechanics in place that help facilitate that further. There's a global storage chest in every base (in-game these are called "Crucibles" and are the main areas where the tower-defense aspects enter the equation) so players can stash their gathered materials for everyone to use, along with any crafted armor or weapons they may wish to share with friends. The host player can set the server to "headless" mode, which allows them to log out of the game but keep it running in the background so their friends can keep playing (this may change in the future where the server is hosted with the devs and therefore always available to players), and can also adjust things like the difficulty based on the number of players. The teleport towers that are scattered about the map (once you locate and activate them) provide a handy system to get around and warp to a friend's aid. Finally, while there isn't a lot of distinction between players early on, after completing a few tower-defense waves and unlocking some more blueprints (which unlock/become available for everyone) for weapons and armor, there's potential for everyone to come up with their own "build." Eden Rising: Supremacy also lets players dictate their own goals whenever they play. Maybe you and your buddies just want to shoot the breeze for a bit and relax, then you're free to go exploring and discover new areas; or go out and harvest materials for the rest of your "tribe" (i.e., friends on the server). If you want something a little more active, then you can kick off a tower-defense wave at one of the Crucibles. There's enough sandbox here for you to have fun, but never feel aimless. All that being said, there are a couple things I hope to see improve in the game before it sees a full release. At the top of that list is the combat, which feels a little "loose" at the moment. When using the glaive, which is a faster attacking weapon, the time between when it looked like my attack animation "hit" and the numbers popped up indicating I was doing damage didn't always line up. Switching from the glaive to the hammer changed my combat animations and bumped up the damage numbers, but otherwise I didn't "feel" a difference. There wasn't that feeling of impact that I've come to expect from using a slower swinging, but heavier hitting weapon. Additionally, I'd like to see a little more variety in the attacks with each weapon. Currently, there are light, heavy, and special attacks for each melee weapon, and a shoot and special attack for the ranged. You can string together three light melee attacks, but you can't transition into a heavy attack or chain together multiple heavy attacks. There is a solid foundation in place for Eden Rising: Supremacy that gives me hope for what the development team will do with this as it progresses through the Early Access and alpha/beta phases into a full launch. I think Nvizzio has some great ideas here and I'm looking forward to seeing where they go with it. Eden Rising: Supremacy is available via Steam Early Access on PC for $14.99. 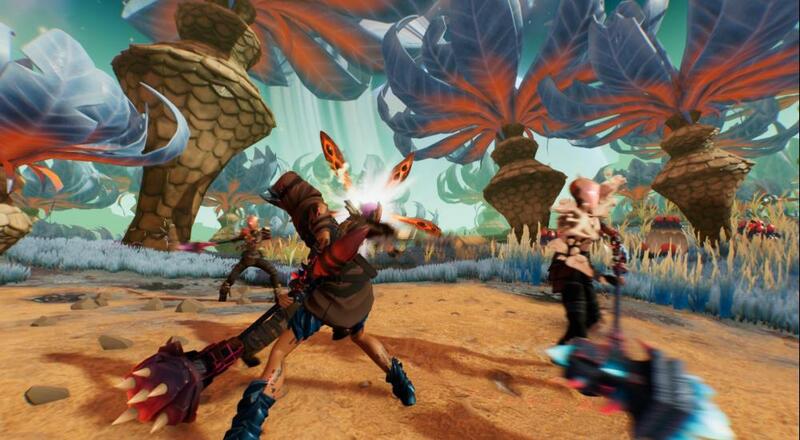 It supports eight player online co-op right now, with 16 player online co-op planned for launch. Page created in 1.3834 seconds.